Every thought & belief you have, has a vibrational frequency and carries instructions that your life and your body is responding to. High frequency, healing thoughts lead to vitality, joy, and abundance. Low frequency, toxic thoughts, lead to illness, suffering & lack. When facing chronic physical challenge, a detox program is often recommended to purge toxic heavy metals, chemicals and poisons from the body which raises the vibration and facilitate a fresh start at being and staying healthy, vital and strong. If you’re facing life challenges, and understand that your thought vibrations predetermine your experience, a detox program specifically designed to purge toxic thinking and beliefs, is imperative. Does your life look the way you want it to? Are there things you would like to change? Do you know what thoughts, words or beliefs you can Shift & Release in order to improve whatever is not working? What would you replace them with? Shift & Release will help you identify, detoxify, and raise the vibration of your thoughts and beliefs, and facilitate sustainable well-being, joy, abundance and a higher frequency existence! 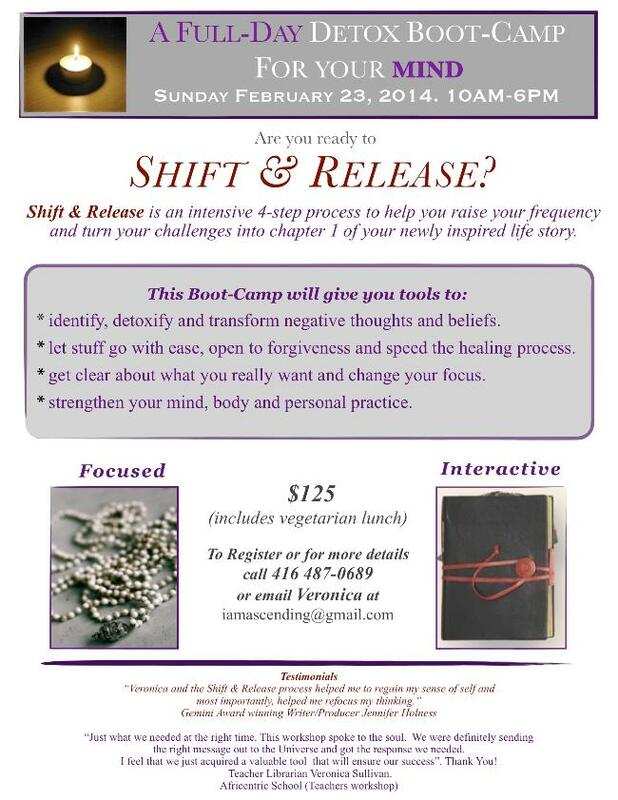 "Before I did the Shift & Release process, I was feeling disconnected, negative and depleted. Worse, for the first time in my life I felt clueless about how to find my way back to the joy. Veronica and the Shift & Release process helped me to regain my sense of self and most importantly, helped me refocus my thinking. Shift & Release is tremendously beneficial. I cannot recommend it enough!" * to drop excess baggage and lighten the load? * to find clarity and make more sense of your journey? * to unlock the door to sustainable health and vitality? * to experience more balanced relationships with the people you care about? * to learn some practical tools you can use right away? * to take responsibility for raising your vibration and creating a higher frequency life? One on One Boot-camp: One Day Detox Boot-camp for just you. Scheduled hourly session: Ongoing Shift & Release weekly sessions.